The sun dimmed, the earth quaked and trembled. The veil of the temple that separated off the entrance into the Holy of Holies was rent from top to bottom, for the Lord Himself not only opened the way into the Holy of Holies, but into heaven itself, to the throne of His Father. Hell shuddered, for its strength and power were tottering. The hills split apart, the sepulchers opened up, and the bodies of the dead arose and stood looking around in wonderment. And they came out of their tombs and went into Jerusalem, appearing to many and asking in bewilderment: what happened? And they were told in reply: It is finished! What was finished? What was finished was the salvation of mankind from the power of the devil, as the soul of our Lord Jesus Christ accomplished its spiritual feat, and the ancient prophecies, foretold by Isaiah and David several hundred years before, finally came to pass. “Surely He had borne our griefs, and carried our sorrows; yet we did not esteem Him stricken, smitten of God, and afflicted. But He was wounded for our transgressions, He was bruised for our iniquities; the chastisement of our peace was upon Him; and with His stripes we are healed. All we like sheep have gone astray; we have turned every one to his own way; and the Lord hath laid on Him the iniquity of us all. He was oppressed, and He was afflicted, yet He opened not His mouth; He is brought as a lamb to the slaughter, and as a sheep before her shearers is dumb, so He openeth not His mouth” (Isaiah 53:4-7). You have heard in the Gospel readings of Great Friday what the prophet King David foretold in his Psalm 21: “For dogs have encompassed Me, the assembly of the wicked have enclosed Me: they pierced My hands and My feet. I may tell all My bones: they look and stare upon Me. They part My garments among them and cast lots upon My vesture.” This is what was finished. Our Lord Jesus Christ gave up His spirit on the cross on Golgotha with the same words that stunned the entire world – “It is finished!” The dead body of Christ hung helplessly, the head – crowned with thorns and stained with blood – fell down upon the chest. The wounds from the nails that had crucified His hands became torn. His Mother came, the apostles came, the myrrhbearing women came, Joseph of Arimathea came and, in great sorrow and amid the shedding of many tears, they took down from the cross the most holy Body of their Master and laid it on the ground. And they wept bitterly over Him. 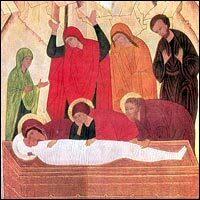 In front of us lies the dead Body of Christ, depicted on the Holy Shroud. Let us, too, weep over Him. On the cross shone the sun of truth, the sun of love, that dazzled the entire world with its light, with the light of Divine compassion. This sun ignited the hearts of millions of people who loved Jesus Christ with their whole soul, in whose hearts the following words were engraved in flaming letters: “Whosoever wishes to follow Me, let Him reject himself, and take up his cross, and follow Me!” The Lord was the first to take up the cross, the most terrible cross, and after Him a multitude of martyrs for Christ took up their own crosses, smaller in size, but often just as fearful. And after them great multitudes of people also took up their crosses and, quietly bowing down their heads, went with them on that far journey. On that far and thorny path indicated by Christ – the path to the throne of God, the path into the Heavenly Realm – they are walking, and walking, and walking for almost 2,000 years already, multitudes and multitudes of people are following Christ. There is a whole procession of those who have rejected all material goods, who have disdained the world for the sake of Jesus Christ, who have left everything that was precious to them and have dedicated their entire life to serving Him. There is a procession of the fools-for-Christ, weighed down with the burden of their spiritual labors and iron crosses; there is an endless procession of monks and nuns; there is a procession of hierarchs with crosses and the Holy Chalice in their hands. There are multitudes of common people who love Christ, who are the fulfillment of His words: “Ye shall be sorrowful in the world.” They are walking along, carrying the heavy cross of their sorrows. There is a long procession of those who were banished for truth, banished for the sake of Christ. Will we not join this endless procession that is moving along the holy path of sorrows, the path of suffering? Will we not take up our crosses and follow Christ? We must! May our hearts shudder at the sight of Christ’s lifeless body lying before us. May the Lord Christ, Who has suffered so terribly for our sake, fill our hearts with His immeasurable grace. And at the end of our long and difficult way of the cross may He grant us the comprehension of His words: “Fear not, for I have conquered the world!” Amen.